Whole30 Quick Reference Meal Guide. Since I just completed my round 2 of Whole30, I thought I would go ahead and share a quick guide to some of my favorite and most-prepared meals. You can find all my favorite Whole30 meals throughout this blog under the tab "Food & Drink", and then click through all the categories, but I thought I would make it super easy for those of you who want a quick reference for exclusively Whole30 recipes. This is an easy way to find what you're looking for over and over again if you're on Whole30 and needing to cook a lot :) I will continue to add to this post as I share Whole30 recipes that become favorites! White Pork Chili - My newest and favorite stew! Not just my favorite Whole30 stew, my favorite of all time! Note: snacks aren't encouraged on Whole30 unless you are pregnant of breastfeeding, which I was during my round 2, so these are some of my faves. Almond Butter Date Round Bites - Coming Soon! Like I said, I will continue to add to this post as I keep finding recipes that are winners. If you need some more guidance, feel free check out my Whole30 Diary (Parts 1, 2 ,3 & 4), my reasoning on why I love Whole30, my 3 biggest takeaways from Whole30 and my favorite tools to use in the kitchen. Happy Whole30 prepping/eating/enjoying to you! 1. Heat a skillet on medium (this one is my all-time favorite because it cooks so evenly), and add coconut oil. Wait until oil is melted completely. 2. Place all the plantain slices in the hot oil and cook for 2 minutes, flipping over and then cooking for another two minutes. 3. Once each side of the plantains is slightly browned, remove from the skillet and let cool on a plate. 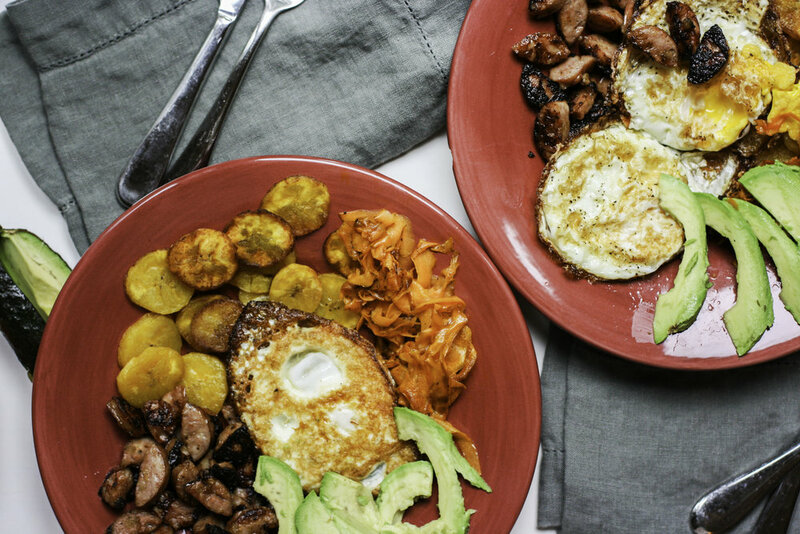 Divide the plantains between two plates for two servings. 4. Add the diced sweet potato and keep it moving around the skillet with a spatula. Allow to cook for 2-3 minutes, until slightly wilted. Add a little extra coconut oil if you need more for your skillet. 5. Add the sliced chicken sausage. Cook for another 2-3 minutes, until heated well (I like mine to char a little bit, but you certainly don't have to let it cook that long since the meat is already pre-cooked). 6. Divide the sweet potato/chicken sausage mixture between the two plates. 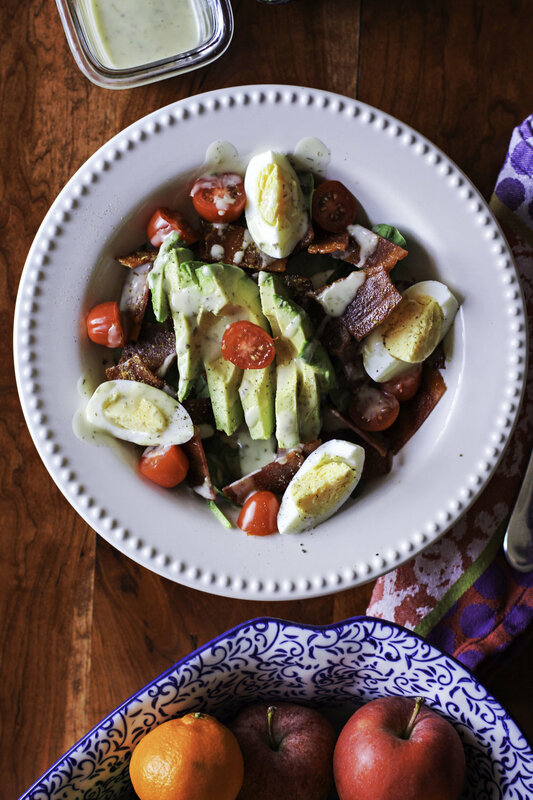 Top with two fried eggs and sliced avocado. Season with a pinch of salt and pepper. Bon appetit! - I've changed it up and added onions, spinach, baby kale, bacon and even cinnamon to this recipe - it all adds it's own flavor which is great! The options are really endless when it comes to a hash situation like this. 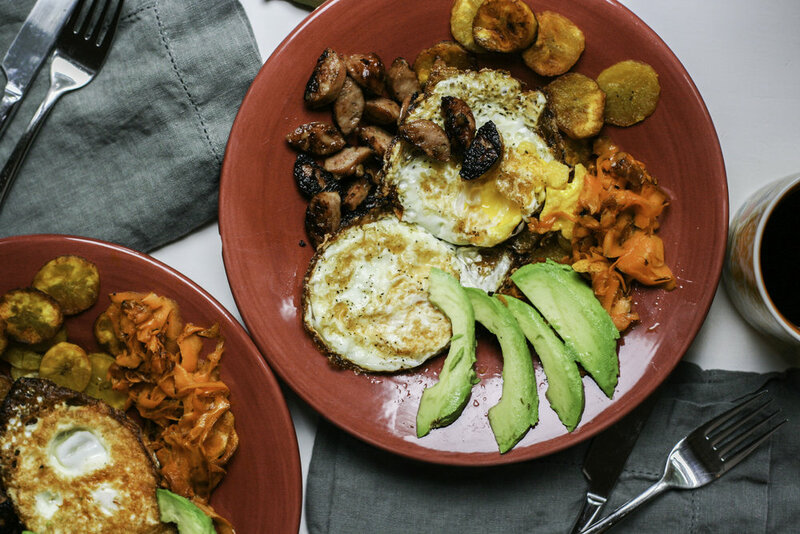 I will say that the basic flavors of the egg, sweet potato, chicken sausage and plantain really "make" this dish - anything else that is added in just helps. - You want to choose a yellow plantain that has begun to brown - this is when the fruit is sweetest. If you choose a green plantain, it won't be ripe enough and will make it very difficult to slice or cook with. - You can also make this recipe with scrambled eggs instead of fried- just pour the eggs into the skillet with the sweet potato/chicken sausage mixture and allow them to cook together. P.S. - I'm working on a Whole30 meal reference guide that will house all the Whole30-compliant meals that we have been eating. I'll be sharing that next week, so keep an eye out! This is one of my all-time favorite meals. Don't let the semi-lengthy ingredient list intimidate you - this is one of those meals where you buy a few unique ingredients once and then you have them stocked for a good long time. And the flavors and textures really make it a perfect meal - it feels so light and fresh and flavorful, yet it is super filling. 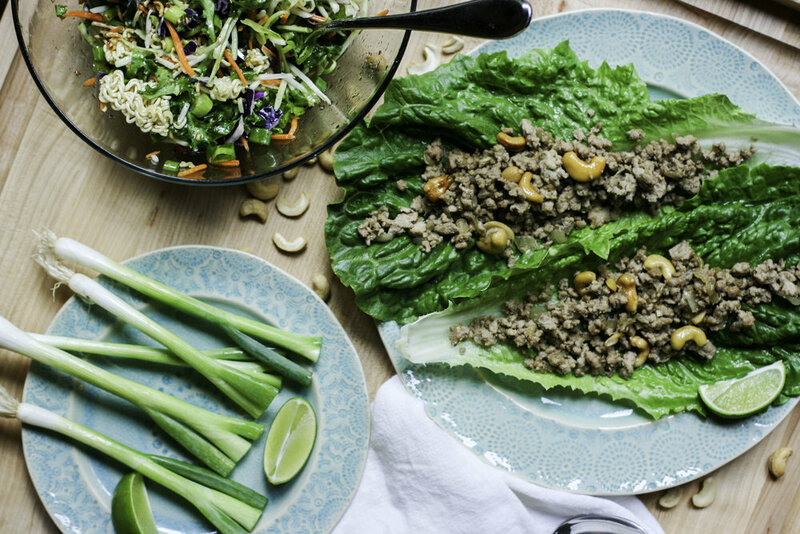 Don't let the term "lettuce wraps" fool you. Every time I make this, Stevie overeats and then blames me for it for his overly-full feeling. He says it tastes too good. I tell him he needs more self-control. It's our bit, if you know what I mean. My dear friend Tricia shared this recipe with me years ago, and it's one that has stuck around as a family meal standard. And since she shared earlier this week about how to get your child to eat anything, I thought it was only fitting that we share one of her grown-up delicacies, too. 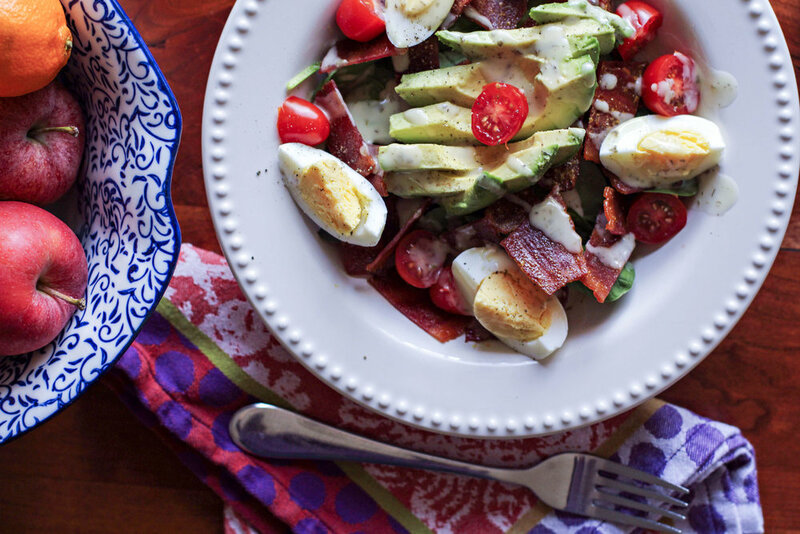 Thanks for inspiring deliciousness, Trish! 1. Begin by softening cashews in a cup of water. Set aside. 2. Brown the meat, onions and garlic in a saute pan until the meat is cooked through and the onions are soft. 3. Once the cashews are softened (about 10 minutes), drain the water and add cashews to the meat mixture. 4. Add Bragg's Amino Acids, ground ginger, and honey to taste. Once it's all mixed together, keep the meat mixture set on low heat. 5. In a separate saute pan, brown the Ramen noodles and almonds in 1 tbsp. of butter until lightly toasted. Set these aside on paper towel. 6. In a medium-sized bowl, mix the broccoli slaw with diced green onions and toasted Ramen noodles. Stir gently and add dressing. 7. For the dressing, combine all the ingredients and vigorously stir until mixed. Top the broccoli slaw and mix well. 8. Layer individual lettuce leaves with meat mixture and slaw. Drizzle with a bit of lime juice. - The amount of Bragg's, honey and ginger is where you can get creative. I start with a little of each, and keep adding to the dish as I taste it and decide the intensity of flavor I want to work with. I probably end up with a couple of tablespoons each of honey and Bragg's, and a healthy dusting of ginger. I hate to say that I'm on a diet for two reasons. The first being that "diet" sounds so negative and restrictive and I just don't think it's a realistic way to live. I am not a person that thrives on deprivation. I don't find it cool, endearing or impressive. But the second reason is that the kind of diet I'm currently on isn't really a traditional diet - it's mostly about being extra mindful about the kinds of things I'm putting in my body. I am breastfeeding a little giant and I don't think "dieting" in the traditional sense of the word is very healthy or sustaining for my little person. 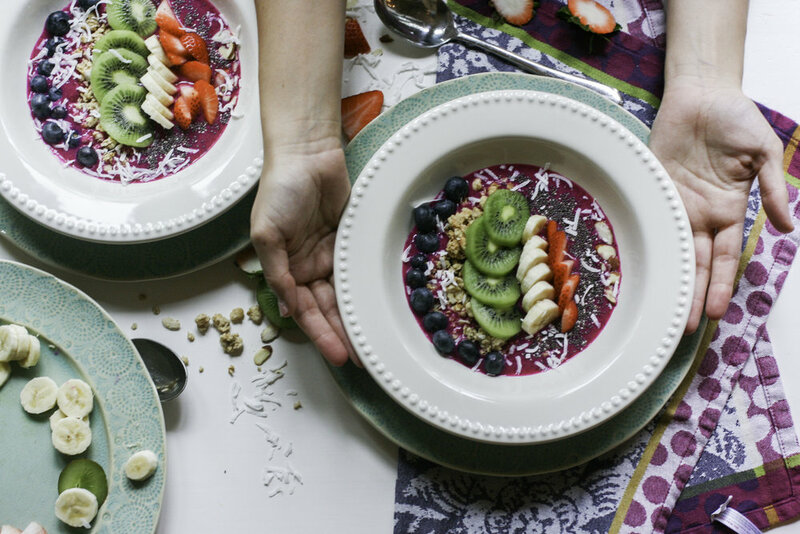 So I am fumbling around, figuring how the best way to eat healthy & wholesome for him while still achieving the right amount of weight loss for me. I knowwwww that it takes time to lose baby weight. But I also know it's not going to just fall off, especially after baby #2. And I would like to fit into my clothes one of these days, you guys. That would be fun. So I am doing my best, cutting sugar and alcohol (again, for the most part - I will allow it here and there if it's a special occasion.) I am trying to focus on what I can eat instead of what I can't. So while I am trying to have lots of fresh fruits and veggies and wholesome carbs and - I am allowing myself to eat these lactation cookies. They are really tasty, and the only sweet thing I'm having in my life right now. But they are doing the trick! I try to eat a salad every day for lunch. I am mostly annoyed with salads because they are rabbit food, so they have to be goooood if I'm going to eat one every day. These are two recipes that I love having over and over again, and I thought it was high time that I share them with you. I can barely call it a recipe, because I mean, it's salad. But still - here are two that are so super duper tasty and wonderful. *I like to prepare my salmon by putting it in a glass pyrex dish, pouring some Italian dressing over the top and baking it at 400 degrees for 15-20 minutes. It's divine. I start with a bed of lettuce, add the other ingredients, drizzle with the olive oil, balsamic vinegar and lemon juice, and then chop up really good. I've realize that I enjoy salad way more if I chop it and mix it really well. Strawberry & Goat Cheese Salad. - olive oil + balsamic vinegar to taste. * I prepare my chicken breast by boiling it for 20 minutes in a pot of salted hot water. Once the meat is cooked and white all the way through, I drain it and immediately shred. I usually prep this on Sundays and keep the chicken in a seal-fresh container, using it throughout the week for anything from salads to tacos. It's super helpful to have cooked protein on-hand at all times! And there you have it! Any yummy salad combos you'd like to share with me? I'd love to hear!